We all have at least one. Most of us don’t write stories down, but somewhere down the road, we all wish that we did. People ask me how Wedding Story Writer began. It’s a long story. To accurately tell you this story, I must go back to the beginning of my life to fill in a few missing pieces. You’re probably familiar with the old saying about how the cobbler doesn’t have any shoes? Well, I have no written love story. I own a few love notes, a handful of cards and a short journal about my honeymoon in Fiji, but no love story and certainly no wedding story. Strangely, it’s one of the most frequently asked questions we receive. I’m going to tell you right now that I can’t remember 90% of my wedding day, and that’s sad…but this is where my story begins. I had met Erick during a time in my life when I didn’t think I wanted a relationship. I had recently moved to North Carolina from Southern Illinois, having left my entire family and best friend. Ambitious and a bit of a risk-taker, I moved across the country by myself–just my nine-year-old daughter and me, a colossal Uhaul and a helpful cousin, Julie. I couldn’t live in Illinois any longer. I had exhausted every possibility for work and happiness, and it seemed like a dead end living situation. You see, I eloped when I was very young…(and still can’t believe I did that). During high school, I had planned my entire wedding out, from the dress that I would make myself to the catering and flatware rentals. I literally had an entire wedding planned out on paper. In fact, I submitted it as a class project and received an A on it. Eloping was so out of character for me, but I thought I was in love and was very impulsive back then. Because that wedding I planned never actually happened, I knew that one day I would be sure to have the wedding of my dreams if given another chance. I didn’t care how long it took or how much money it cost. I wanted the ring, the dress, the veil, the bouquet and most of all an adoring husband. It must sound outlandish to someone reading this story, perhaps even more to a person who never put any thought toward a wedding until the time came. 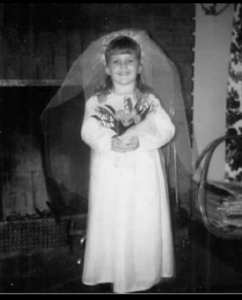 For me, my love and desire of being a “bride” go all the way back to age three or four. (My mom swears I was three. I remember being four. She’s probably correct.) Playing dress-up was my favorite past time. During those years, my father worked the graveyard shift and wasn’t around too much. One night, my mother pulled out a huge box from under her bed. Within the box were her wedding dress, veil, garter, and shoes. She took the white dress out and carefully laid it on the bed. I remember touching the gown, a simple short-sleeved dress with a floral lace bodice and empire waistline. Her veil was full of daisies, perfect for a wedding in 1969. I asked her to put the dress on. She wasn’t sure if it would fit, but it did. It’s funny how I can’t remember too much before this childhood experience, but this particular life memory is crystal clear to me. My mom came out of the room, a full-fledged bride…a princess in full regalia. I could barely contain my excitement and only wished that I could fit into the dress myself. I became obsessed. The next Halloween, my mom made me a bridal gown for trick-or-treating. I had a plastic lily of the valley flower bouquet and a short veil. I thought I was a bride and walked around like a queen. The next two years I wore that dress until it was too small for me to fit into any longer. I was a witch when I was seven, but I digress. At one point, my mother found another used wedding dress for me to play dress-up. That summer was the best one ever. The polyester dress was incredibly hot, but I managed to prance around in that old thing, dragging it in the dirt and grass as I visited my amused neighbors. I’m sure they got a big kick out of seeing me in my wedding day finery. Along with the obsession of playing dress up in wedding gowns, I also began drawing them. My mom bought me Bride’s and Modern Bride magazines to fuel my imagination. I studied them. My sister, Bonnie, and I would sit on my bed and say, “I’m her” as we turned the pages of the magazine. It turned into a battle of which one of us could shout it out, calling the “prettiest” bride “me” before the other one could. The years went by. I decided I wanted to be a model–modeling wedding gowns for Bride’s Magazine. Unfortunately, being a very short-statured woman (and young girl), modeling for a magazine just wasn’t in my cards. After trying and failing to get modeling jobs, and to my chagrin, I eventually knew I would never grow to be 5’10” tall, the shortest height to be a fashion model. Nevertheless, I still bought at least one wedding magazine per year…to study the gowns. When I was sixteen, I received my first real wedding dress, one not for playing dress-up, but more as a beautiful dress to “admire.” One wedding dress lead to another. Over the years I have amassed well-over 160 vintage heirloom wedding dresses and veils from 1910 to modern. (There’s an interview on UNC-TV if you want to check it out). I’ll get to that story later, however. I hear that a lot. 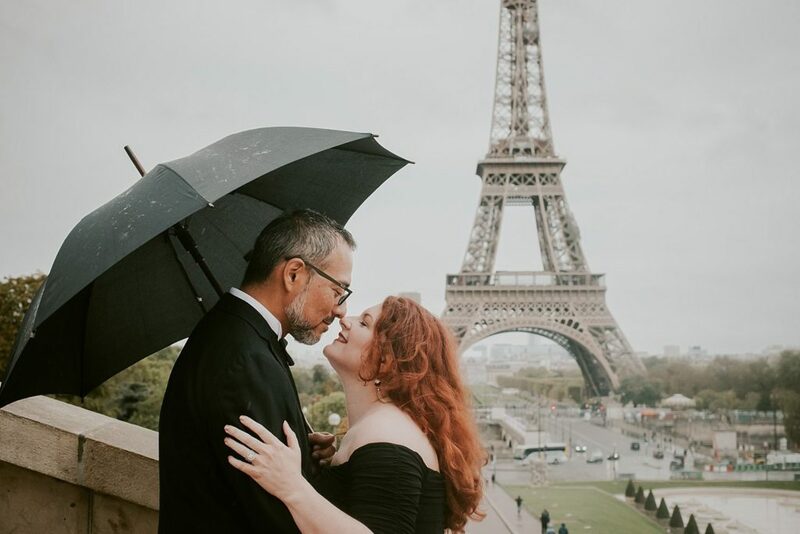 It wasn’t until I began planning my wedding to Erick that I was fully able to realize my dreams in the wedding industry, but it wasn’t to design dresses or to plan weddings. More of our story to come soon!